You may be wondering how many carbs per day to lose weight fast. Your concerns about low-carb intake are a good step forward as one of the main culprits for weight gain is consumption of excess carbohydrate. Easy to achieve fast weight loss by reducing the amount of carbohydrate consumed daily. In other words, you need to limit the sugar intake to the optimum level. But what actually happens is with an insufficient amount of calories intake you will soon begin to feel brain fog and tiredness. When you are low on energy, there is an instant urge in you to eat more carbohydrate. It is, for this reason, that brain keeps sending you the ‘signals of appetite’ when the energy source is running out of stock. It does not mean that you need to keep eating many carbs to satiate the feeling of hunger and appetite. Your brain can be trained to adapt itself to run on ketones when sugar is not available. Let see in detail the importance of maintaining a low-carb diet for losing weight and protecting yourself from diabetes and cholesterol-related health issues. I am sure that you may have come across a hundred times already the insistence on a low-fat diet for losing weight by dieticians. In fact, each and every dietitian could be bombarding you with recommendations of a low-fat diet with calories restrictions. Secondly, it is hard to stick to a low-fat and low-calories diet for long especially when you live a very active life that requires lots of energy. In this case, another commonly recommended diet suggestion for you is to follow a diet with a very low amount of sugar and starches. You literally need to consume very little of wheat, rice, long grains, cookies, cakes, bread, etc. which are rich in starch and sugar. The alternative to starch and sugar-free diet is healthy proteins, dairy fats, and vegetables. The clear winner among all the diet plans is the low-carb diet. With a low-carb diet, you can satiate your appetite and supply the body with optimum calories and essential nutrients without making you gain weight. The scientific reason behind the low-carb diet for weight loss is simple. Mostly the body gets energy by burning carbohydrates for fuel. In case, when the body does not receive sufficient carbs, a metabolic process called ketosis comes into effect. Under ketosis mode, the body begins to burn its fat for fuel. When your fat stores become a primary energy source, you will lose weight. We have multiple benefits in following low-carb diets. We do agree that traditionally popular low-calories and low-fat diet plans will certainly help you to shed pounds, but you can have a healthier life, and greater weight loss results with a low-carb diet plan. Strictly speaking, there is no general rule that can exactly determine the optimum amount of carbohydrate daily to be consumed by an individual. Bodily energy requirements of each person are different. The ‘low-cabs diet’ plan followed by one individual may prove to be high-carb for another. Each person needs to decide upon the optimal level of carbohydrate required by her according to her age, routine activities, metabolic health, food habits, and personal choices. For example, it is obvious that a sports person who engages in very active sporting should have a lot of carbohydrate-rich food in comparison to an elderly woman who lives a sedentary life. Some people are high on “carbohydrate intolerance”, an inability to process the nutrients in carbs into energy. This weak metabolic syndrome causes Type II Diabetes and promotes obesity. So you should understand your personal energy requirements and your physical energy levels to decide how much of low-carb diets you require. Let us have a look at some standard norms and practices followed in low-carb diet plans which seem to work well for most people. This moderate level is good if you want to stay fit without putting on further weight. Usually, the carbohydrate intake requirement depends on the body weight of the person, i.e. total body weight (in pounds) multiplied by 12 will the amount of calories per day required by the individual. So if a person weighs 150 pounds, she would require 1,800 calories per day. Here we are taking into consideration carbohydrate required per pounds of body weight only. However, we cannot generalize these requirements equally for all, as some will require much more carbohydrate intake per day as they may have to perform physical activities that required a lot of energy. Again, as weight loss happening progressively, you need to keep adjusting the calories intake according to the current weight. Carbohydrate is the major source of calories needed by the body. Nearly 60% of the calories needed by the body should be supplied by the carbs we eat. For faster weight loss we need to eat fewer calories, which would mean less carbohydrate in our diet. 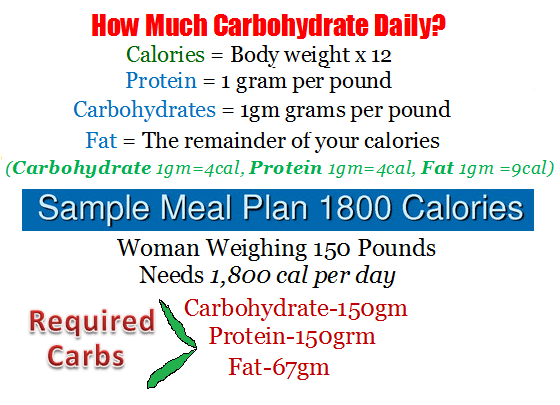 If a person requires about 1,600 calories daily, try to limit the carb intake to about 180 to 240 grams maximum. One of the best ways to reduce the excess carbohydrate intake is to remove all unhealthy carb sources from your diet. Some of the common bad ones are wheat, added sugar, pastries, and desserts, pasta, sugar syrups, white rice, etc. Cutting down on your daily carbohydrate diets do not mean that you will have to go starving to lose weight. The best low-carb diet solution for you is to have more food items that have a minimal amount of carbohydrate in them. If you are looking forward to maximizing the weight loss process, then it would be better to bring down the carb intake by a few grams every other day. Finally, you will be taking not more than 100 grams of carbohydrate per day, which will get your body into ketosis and supplying energy to the brain via ketone bodies. It is not healthy to make a drastic reduction in carb intake all of a sudden with the intention of quick weight loss. The reduction in carb consumption must be gradual to make your body get adjusted to the changes naturally. Within a few weeks time, you can limit the daily carbohydrate intake to as low as 50 grams. If you have added a lot of vegetables, seeds, nuts, fish, and meat into your daily diet, then you get the optimum level of carbohydrate from them itself. Low-carb does not mean any carbohydrate at all. Our aim is to limit the carbohydrate intake exactly according to the daily calories needed by the body. If you try to avoid carb diets, totally it will damage your health over a period. A person who is under medication should not think of low-carb diets without the consent of the physician. Remember that every person is unique and what works well for one person may not be good for another. It is important that every person identifies her specific needs for carbohydrate depending on the life situation she is in. The below-given chart indicates the carb needs of the different category of individuals. Low-carb diets may not be good for persons who are into weight-training, active sports and hard manual labor. Lack of carbohydrate will deplete muscle glycogen and can cause muscle fatigue and physical weakness. If the body is supplied with less carbohydrate than required, the liver will have the heavy stress to produce glucose from fat and protein. Turning protein into glucose process also produces toxic ammonia that will increase the occurrences of pathogenic infections. The goal of weight loss diet follow daily is a choice you make on living a healthy life for long rather than just looking for temporary weight loss results. We should decide upon healthy levels of daily carbohydrate intake on a realistic and healthy diet plan which involves low-carb diets, unprocessed foods, fruits, nuts, seeds, vegetables, healthy fats, and lean protein. In no ways, we should entertain junk foods in our menu even if they are low-carb foods. It is best to have a low-carb diet with natural fiber-rich food. Wheat and rice are easily available to us, but have them in very limited portion or avoid them as much as you can as they contain too much of carbohydrate. It is true that daily low-carb diets are ideal for steady weight loss. It works well for reducing the belly fat especially. Many of the diseases affecting the body can be prevented by shedding the belly fat. You will succeed with low-carb diets only if you can cope up with the energy crunches you will experience in the initial stages of daily low carbohydrate diet plan. Finally, among all the daily diet plans available to you, the low-carb diet is most simple and easy to follow. It is a healthy diet plan that you can adopt for entire life. b)	Never eat carbs in the wrong time. Crabs are healthy as long as they are incorporated into the daily diet in a balanced amount. It is always good eat majority of the daily carbs intake in the earlier part of the day or by noon. Most importantly never eat carbs late at night (better to have more protein rich diet for dinner). The worst carbohydrate foods are sugar laden junk foods that must be avoided as much as possible. I would say that crabs should not be a priority diet. Protein is important for satiation, better growth and maintenance of muscles. I always set aside calories to meet the maximum protein requirements of the body before thinking of carbohydrate needs of the body. But Carbs are good if you are on with some serious physical activities. I hate having a crab diet! Nothing like getting crabs. As stated by the Institute of Medicine, adults and kids should consume at least 130 grams of carbs each day, and 45 to 65 percent of their calorie consumption as carbohydrates. Since lowering your carb consumption and increasing protein intake can help reduce your total calorie intake for fat loss, aim to consume about 50 percent of your calories from carbs for weight reduction that is successful. More carbs to replace muscle glycogen lost during physical training are required by sportsmen; some sportsmen want up to 70 percent of the calorie consumption from carbs, based on the American Academy of Orthopaedic Surgeons.